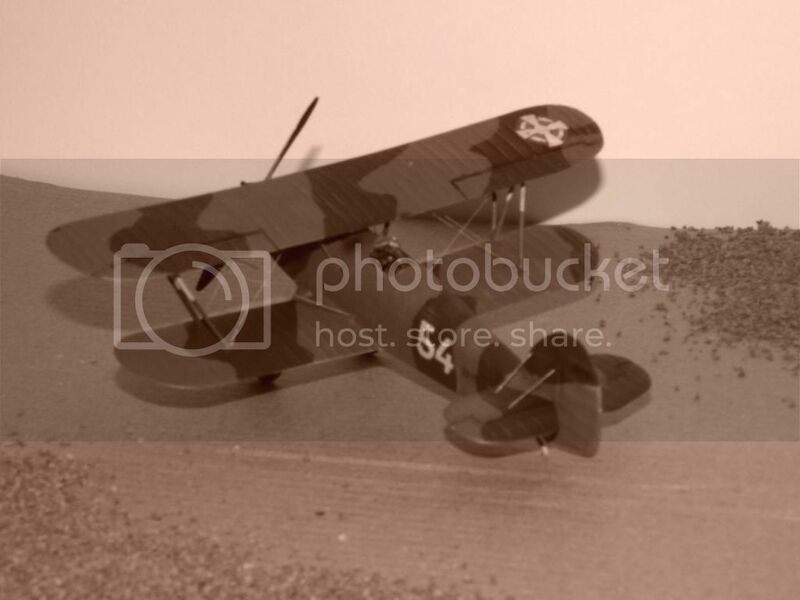 Here's my latest effort: a Hawker Fury II in the markings of the Royal Yugoslav Air Force. 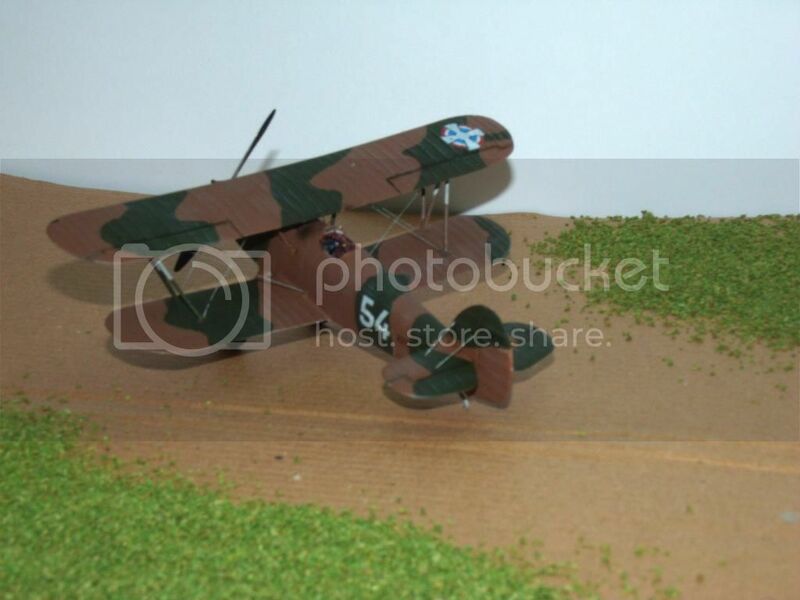 The Fury was, of course, an iconic fighter of the 1930's RAF, but it also enjoyed some limited export success. The RYAF bought a batch of Mk I's (similar to the RAF's version), then a second batch of Mk II's. The first few of these were built by Hawkers, but the lion's share were licence-built in Yugoslavia, shared between two companies. The Fury II was distinguishable from the Mk I by the improved, streamlined radiator (similar to the Hurricane, with the supercharger inlet too), and the cantilever undercarriage very reminiscent of the Gladiator. The other big difference was the installation of a different model of the Rolls Royce Kestrel engine: this gave much more power and racked the Fury's maximum speed up a respectable 242 mph. The Yugoslavs also experimented with improving the firepower: a pair of extra machine guns could be fitted under the wings in fairings that were again reminiscent of those on the Gladiator. Despite all these improvements, by 1940 it was clear to all concerned that the Fury was woefully obsolete in the era of Hurricanes, Spitfires and Bf109's. 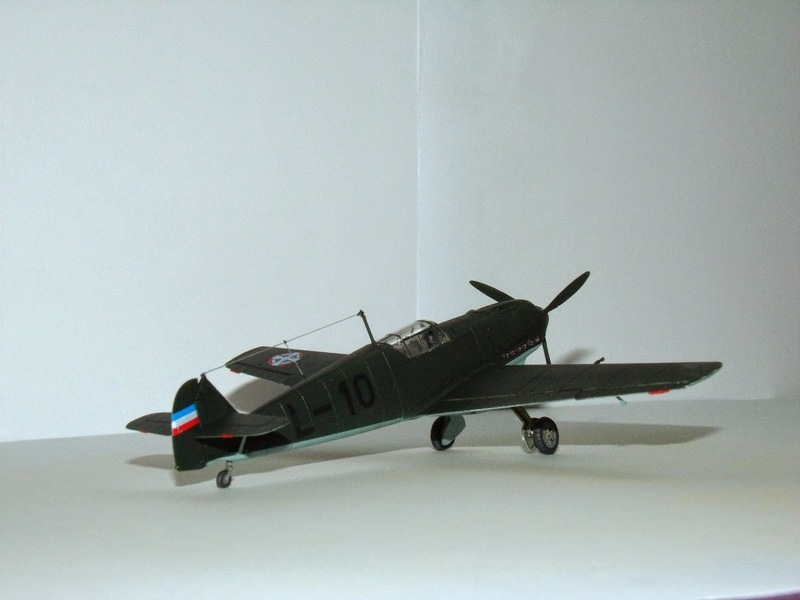 Lacking enough more modern fighters, the RYAF had little choice but to deploy their remaining Furies when the invasion arrived in 1941. The extra machine guns were never used: presumably the effect on the already inadequate performance was too great. 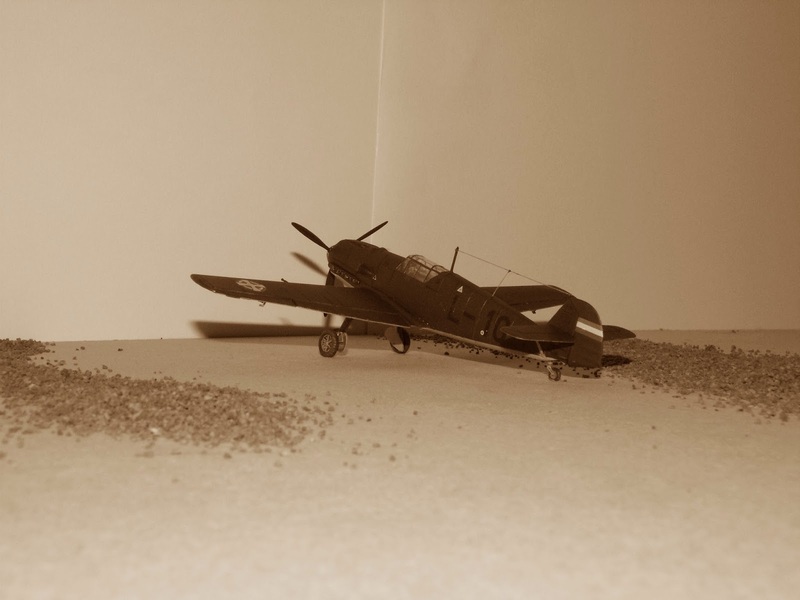 Many of the Furies were shot down in totally unequal fights with Bf 109's and 110's, although the Germans lost five fighters destroyed by brave Yugoslav pilots, all by ramming. The Furies fought on, strafing infantry columns, slowly retreating. Many damaged aircraft were destroyed by ground crews, but when the fighting ceased several were captured intact by the Germans and Italians. The Italians continued to fly at least one for a while, but interestingly none were passed onto the Croatian Air Force. 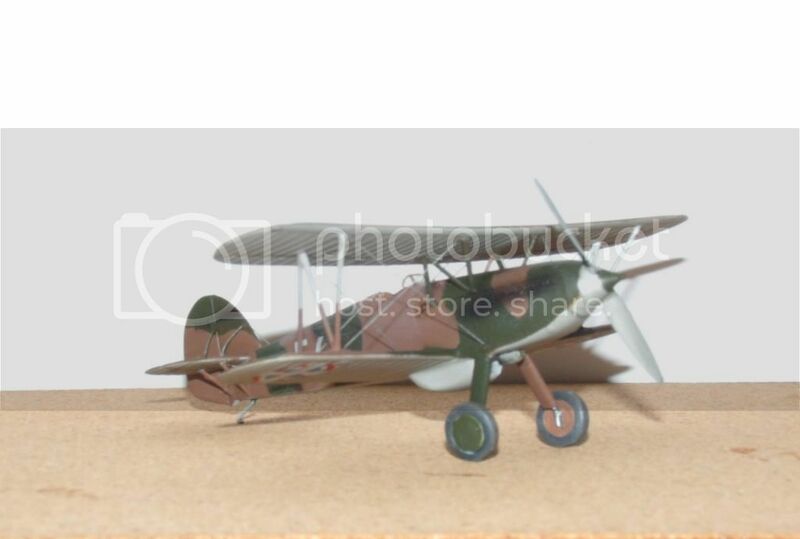 The build was based on an old Matchbox Hawker Fury, now sold via Revell. I had to totally scratchbuild the interior, drill out guns and exhausts and mould the radiator using a wooden former. The undercarriage was scrounged from a new Airfix Gladiator and was a reasonably easy fix. The decals are spares from various Kora sets, supplemented with home-printed codes and stencils. I replaced the plastic skid with a bit of brass strip (the other would last about two seconds!) and rigged her with Bayer perlon fishing line courtesy of a colleague. I 'm not totally happy with how the rigging points look on the wings, but I ran out of will power, and a set of brake pipes wouldn't have gone amiss, but I'm happy enough. Lots of work, but great fun. Finally, here's the token sepia shot. Enjoy! Merry meet, merry part, merry meet again. Here's the latest build completed. 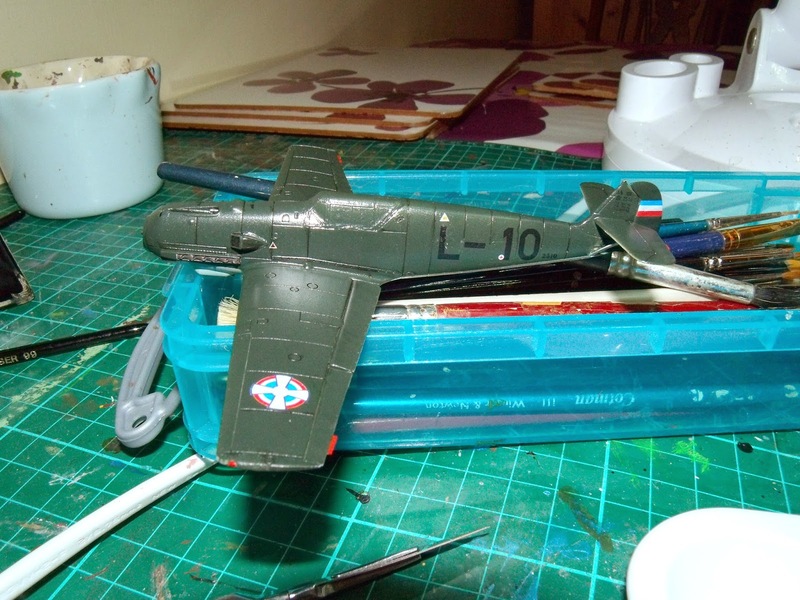 It's another Airfix 109-E, but this time in the markings of the Royal Yugoslav Air Force. 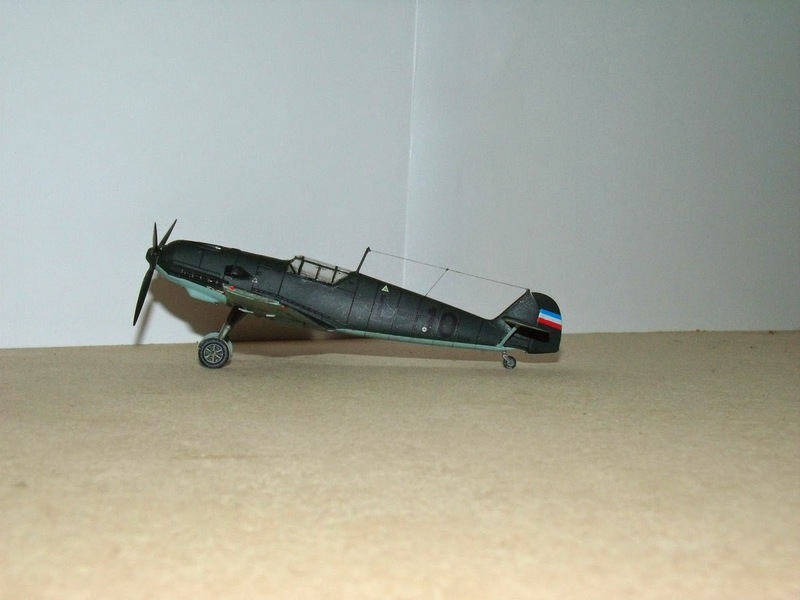 The RYAF had bought about 70 Bf109's paid for with an exchange of minerals/metals. 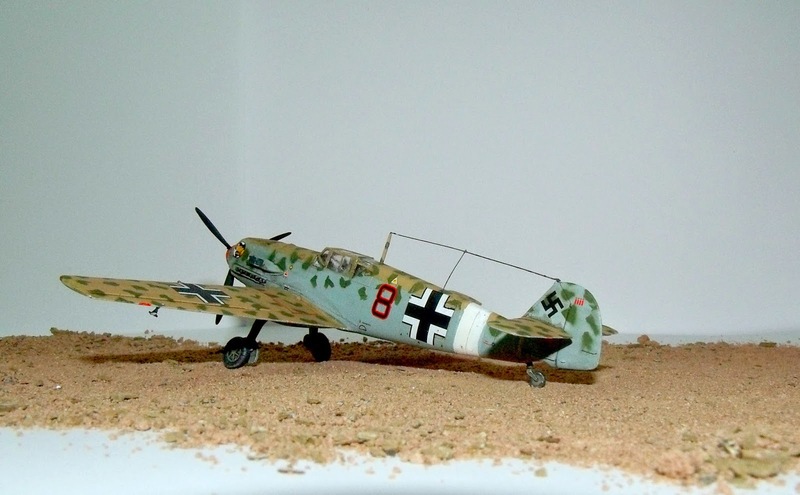 The Bf109E3a was the export version of the same E-3 the Germans flew. Apparently the Germans were less than forthcoming with spares etc, and provided an after-sales package that would have no chance of winning any sort of customer service awards anywhere. The RYAF flew a selection of modern fighters and bombers at the start of the war, and was much stronger than (for example) the Belgian or Dutch Air Forces. However, they were outnumbered about eight to one on paper by the Axis forces, and in practice due to serviceability issues, the RYAF couldn't put their entire force into the air when the Germans attacked. 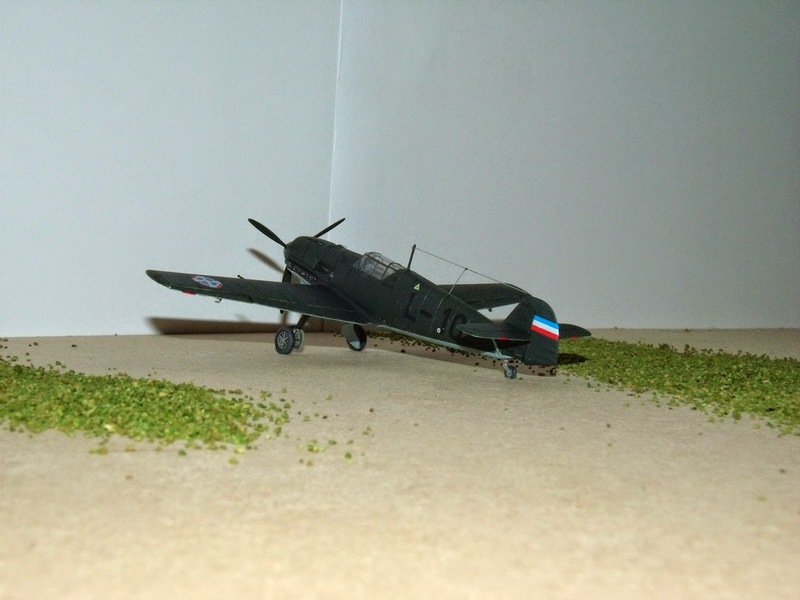 Despite being short of spares, fuel and even machinegun ammunition, and lacking thecombat experience of their enemies, the Yugoslav pilots' morale was unaffected, and there were occassions when there were more aircrew wanting to fight than aircraft for them to fly. Obviously this is not an out of the box build. 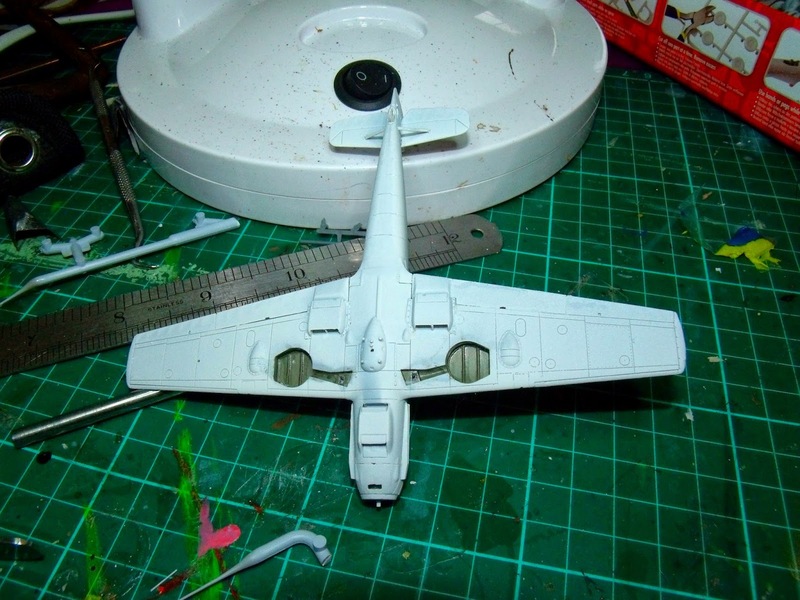 The Airfix kit depicts an E-4 or E-7, which had a differently shaped canopy with a lighter frame, and (according to photos) no head armour for the pilot. Here's obligatory shot of the cockpit before it got closed up. 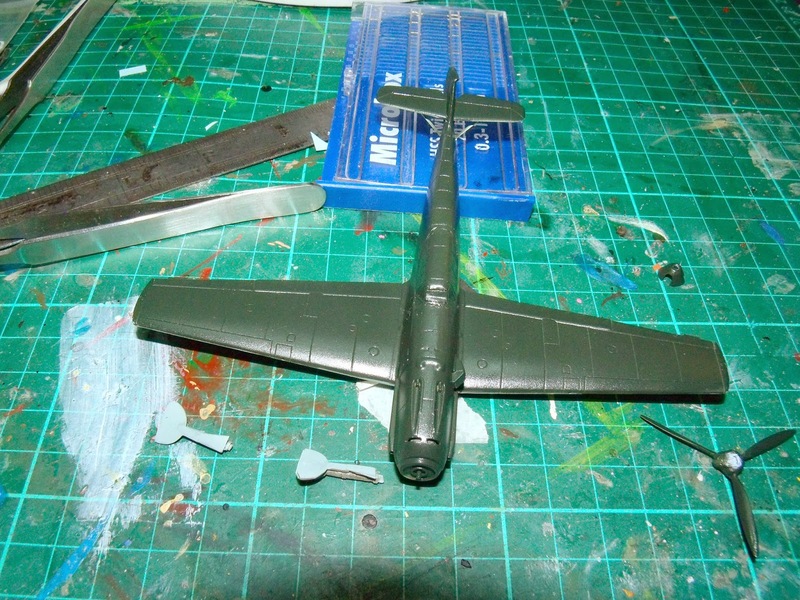 The detail provided by Airfix is pretty good, and once the canopy is closed, almost invisible, so there's little need to add much else. I went with straps on the rudder pedals (the seat has harness moulded on), trim wheels, throttle/mix levers and a seat adjustor from stretched sprue. The undercarriage legs/doors were hotted up with brake pipes added from fine wire. The alternative canopy was a vacform from Pavla. 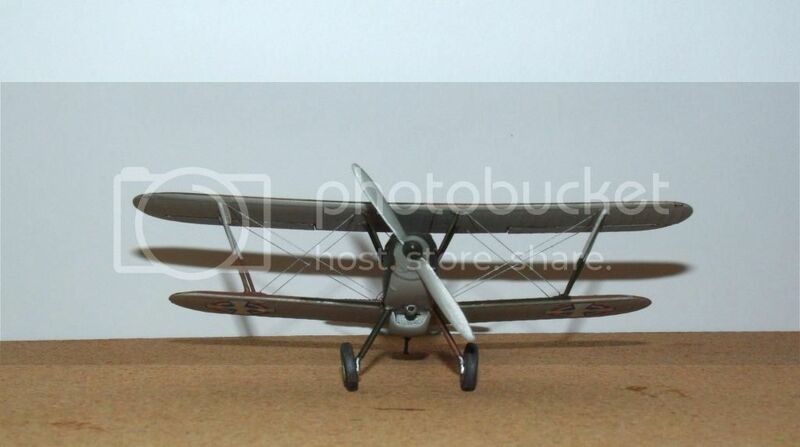 I bought it on Ebay, as a pack with a second canopy from a 109-K - goodness knows when I'll use it! It was a very long time back when I last did anything involving vacforms, so I was a bit nervous starting this. I followed the usual practice of carefully cutting out the part. 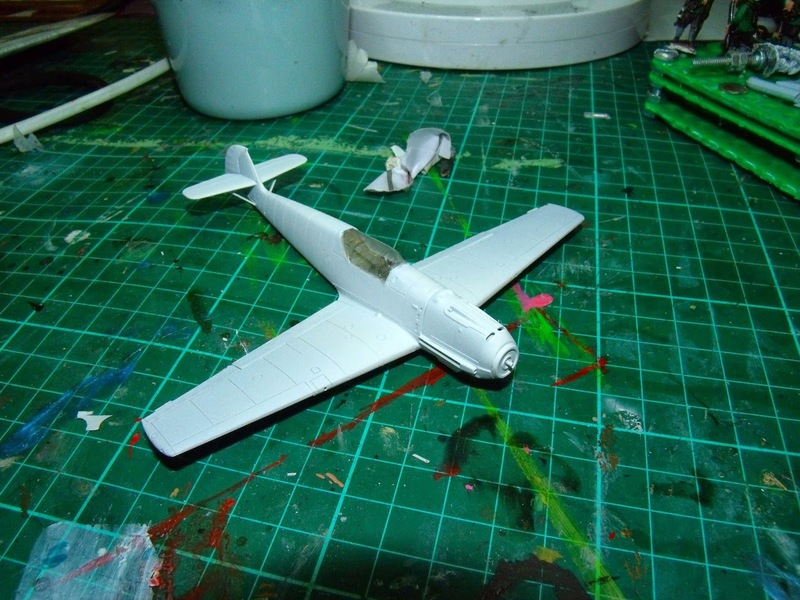 Pavla mould the canopy including some pieces of rear fuselage and canopy, so it's easy to cut out the proper part, and probably it allows the canopy to fit on different manufacturers' kits. Sanding, checking, more sanding and more checking eventually gets the fit OK.
A little bit of filler around the canopy blends the join, but a little bit of sanding on the fuselage behind the canopy is necessary to deal with a slight width mismatch. Once sanded, the canopy is a treat. It's very much thinner and clearer than the kit offering, and allows more of the cockpit to be seen. 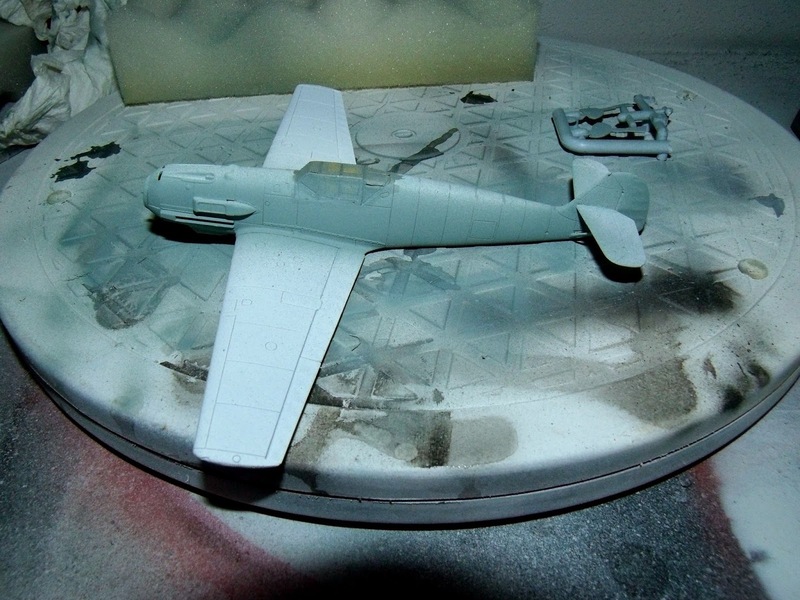 I drilled out the machinegun and cannon barrels, and the exhausts which improves their look no end, and added a vertical reinforcement bar in the underwing radiators. The paintwork was simple: RLM70 over RLM65, both out of the pot Tamiya acrylics which airbrush beautifully, followed by about three coats of gloss ahead of the decals. The decals are from a company called Kora (set 7234). They are thin, flexible and in perfect register, but the white is a little bit thin over RLM70. They're absolutely fine over the RLM65, but if I had a do-over, I would underpaint the upper wing markings and the tail stripes in white. After this, it was another coat of gloss to seal and then detail painting. 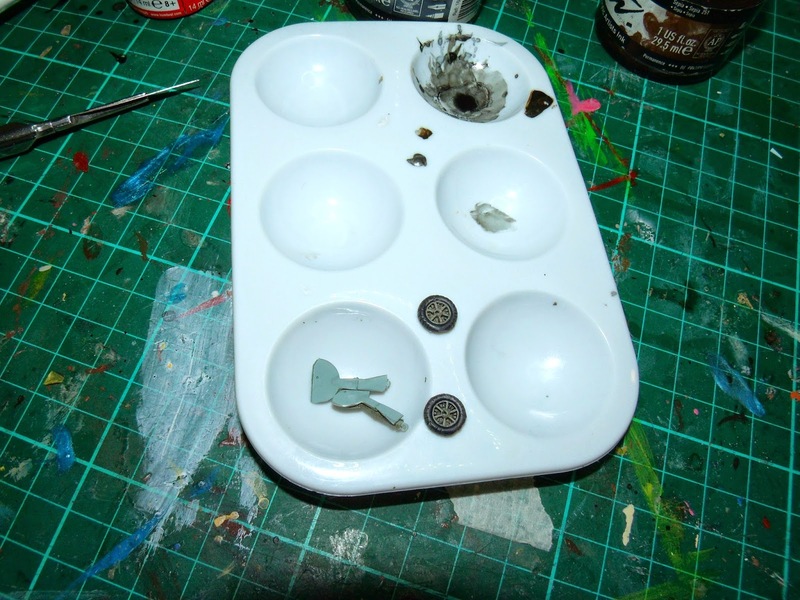 Guns, trim tabs, landing lights and the like were done with a brush, as was the panel line wash, using acrylic ink. The wheels are resin extras that come in with the decals, and the detail is superb. 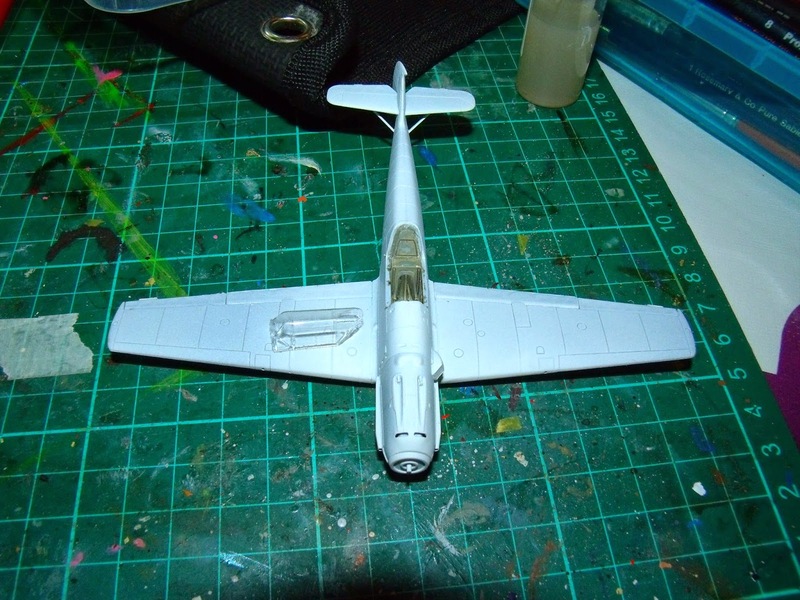 Here she is after the final addition of things like pitot tube, aileron balances and the radio aerial from stretched sprue, and a coat of matt to flat things down. L-10 was part of the 142. Lovacka Eskadrila, from 32. Grupa at Krusedol airfield. Second Lieutenant Miodrag Aleksic flew the plane to score an aerial victory over a German Bf109-E (and at least one other kill) during the invasion in 1941. 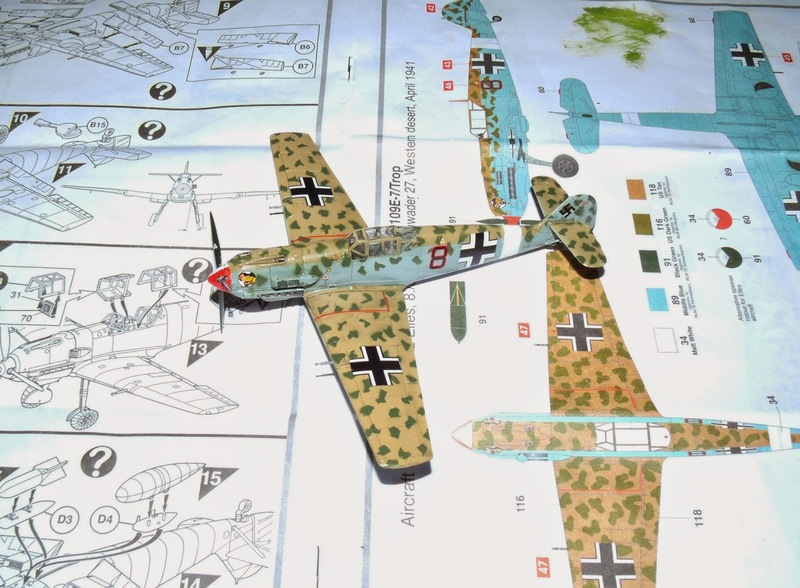 Well, here's my first completed build, Airfix's Messerschmitt Bf109-E7/Trop. Cockpit detail as provided by Airfix is pretty good - vastly better that I remembered from the earlydays of a misshapen pilot sat on peg! 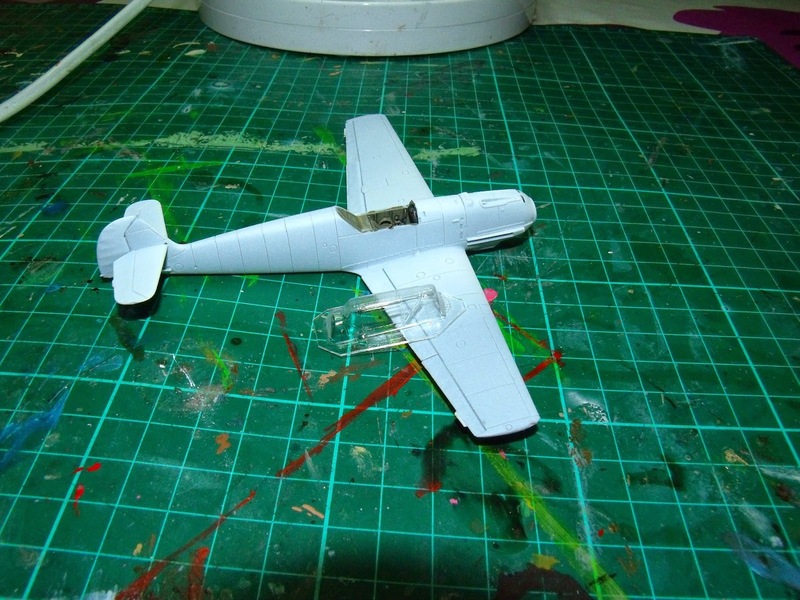 I added straps on the rudder pedals from tape and trim wheels from stretched sprue. Here's a quick shot of the cockpit before closing up the fuselage. 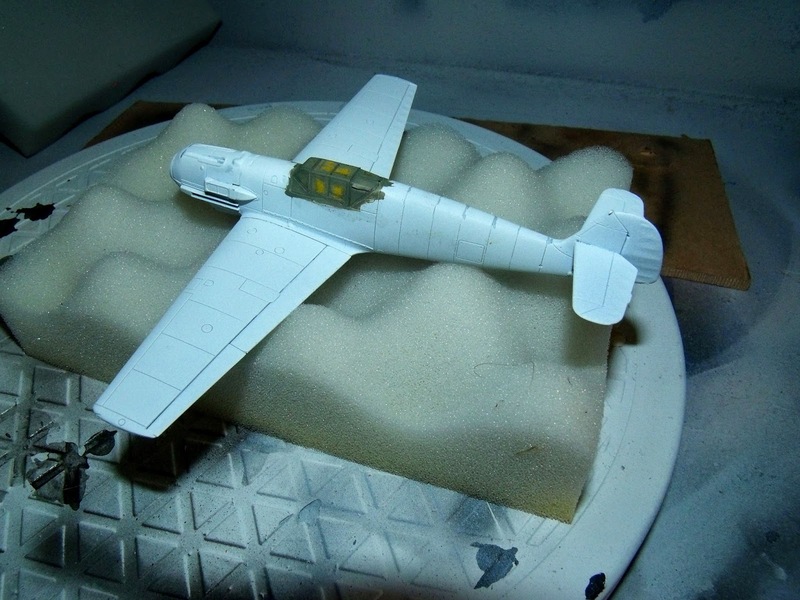 Assembly is quick and easy, and the aircraft goes together without difficulty, and minimal filler! The kit includes the additional tropical dust filter for the supercharger. Detail in the wheel wells is nice, and shows up nicely with a bit of washing and dry-brushing. The underfuselage drop tank fitment is one of the things that visibly makes this an E-7 rather than an E-4. 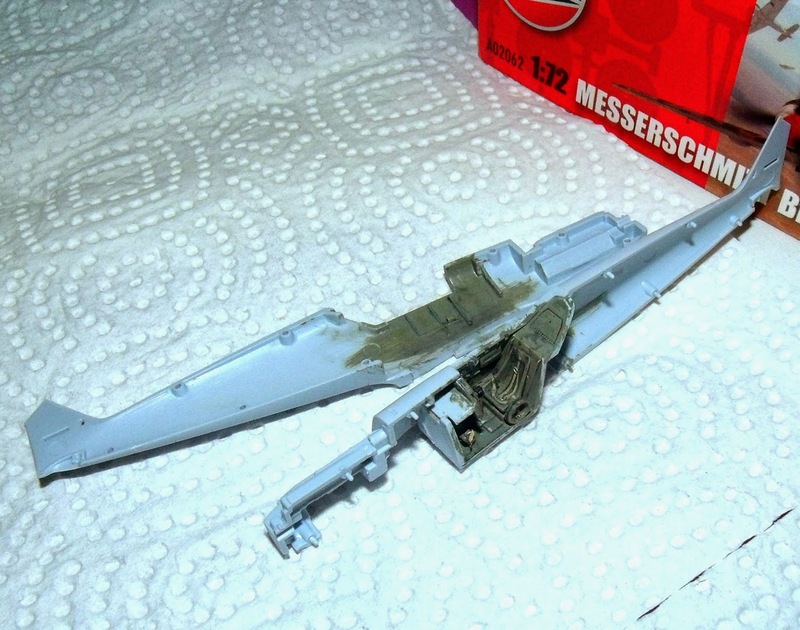 I added the vertical strengtheners in the underwing radiators from stretched sprue. 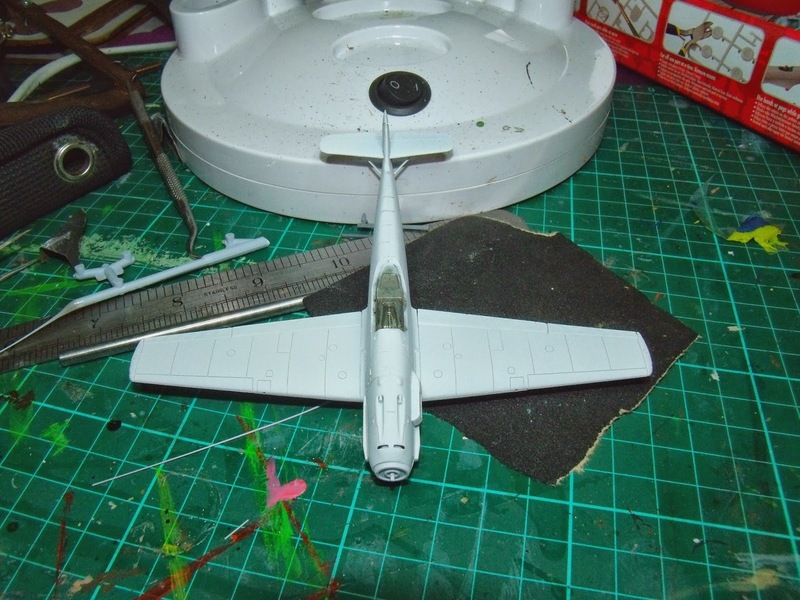 I fitted the canopy at this stage, and it needed a touch of filler to makeit fit perfectly. 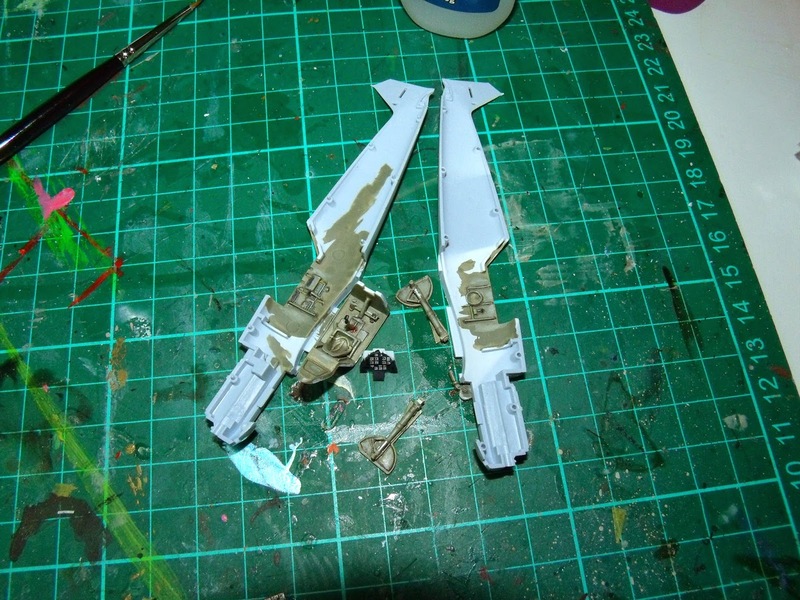 After masking up, a quick coat of RLM02 will give the sense of the internal colour of the cockpit framing. 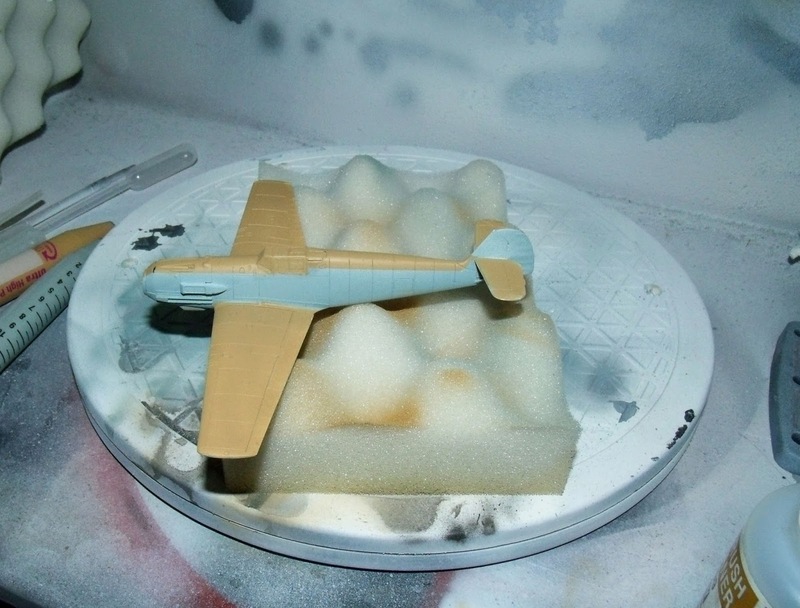 Next thing was a coat of white primer from a spray can. My experience with miniatures makes me gravely suspicious of how well acrylics straight onto plastics will last! came close to abandoning the airbrush. Luckily, Tamiya paints thin perfectly and spray effortlessly. The RLM79, againmixed from Tamiya, went on next. The high demarkation line was normal. 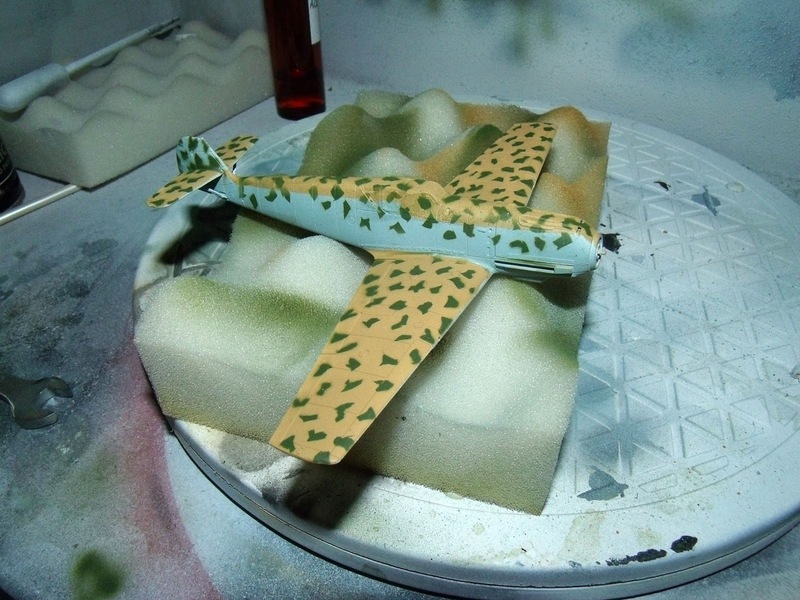 The RLM80 mottle was sprayed by finding a "skin" from a videogame, and after printing it off to scale, using it to cut a set of masks or friskets. I put on a couple of coats of Kleer to give smooth surface for the decals, and also to give an easy-clean surface to go with detail painting. 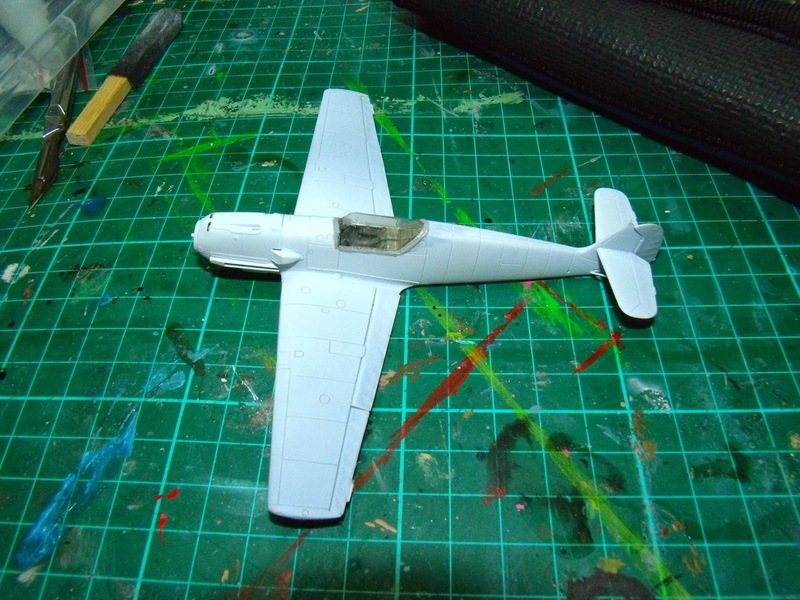 I sprayed in the white fuselage band, then added the decals. 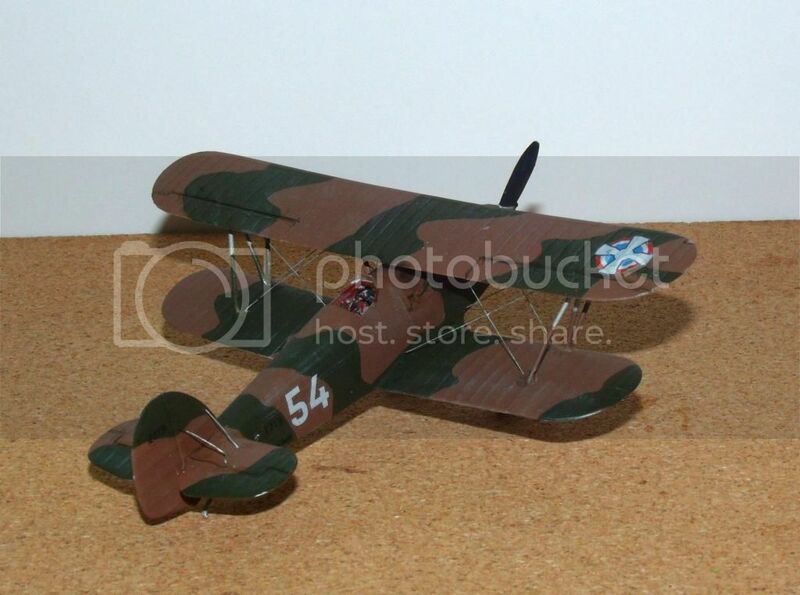 These are Airfix's out of the box offering, an aircraft of the legendary JG27. There is an alternative in the form of a Bulgarian Air Force 109-E4, in dark green over light blue, with extensive yellow trims, which also looks pretty nice. The decals are easy to apply. They didn't silver, except in a couple of barely noticeable stencils. 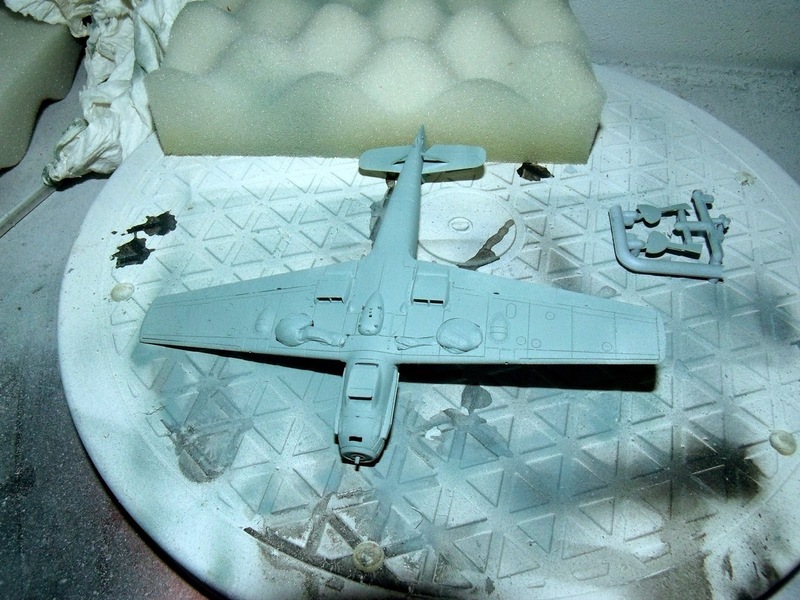 Propellor, spinner, guns etc were hand-painted and added as late as possible, to avoid breakage. 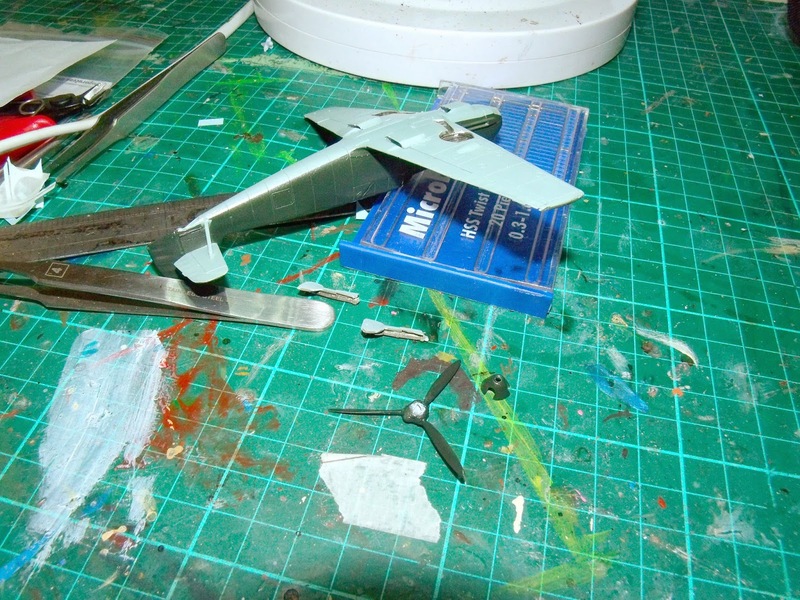 The very last pieces were added at the very end: the radio mast and aerial, aileron balances and pitot. Here's an effort at an "in action" shot. The last shot is an effort at a sepia-toned version. This aircraft, Schwartze 8, is sometimes described as the mount of Leutnant Werner Schroer, the famous Luftwaffe Expert who was Hans-Joachim Marseille's commanding officer. Although Schroer did fly Schwatze 8, it was literally only a couple of times, and the regular pilot was a chap called Franz Elles. Franz Elles began operations in 1940 with 1 Staffel, I./JG-27 and saw action during the battle of Britain under the command of Edu Neumann. Transferred in early 1941 with I./JG-27 to North Africa, he flew as wingman to the famous Knights Cross holder Karl-Wolfgang Redlich. Elles amassed five "kills", four Hurricanes and a Douglas Boston. Elles was shot down, defending his leader's tail in a close air combat with P-40s on 11 December 1941, 40 km SE of Ain-el-Gazala. 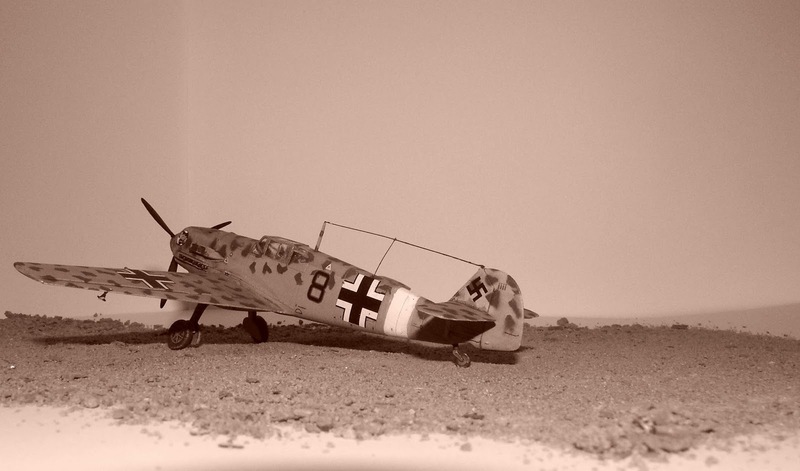 He was flying Bf 109F-4/Trop WNr.8537, "Rote 9" of 2./JG 27. He spent the remainder of the war as a POW in Canada. After the war, he joined the German diplomatic service and rose to become German Ambassador to the Central African Republic. And good cheer accompany you. To the Oak King, farewell and thanks for the bounty of summer. To the Holly King, greeting and blessings for this half of the year. In keeping with the view in the Rulebook that these troops are drawn from the lowly, insignificant peasants, the poor old levy don't even get a Led Zeppelin quote! The levy are extremely simple. 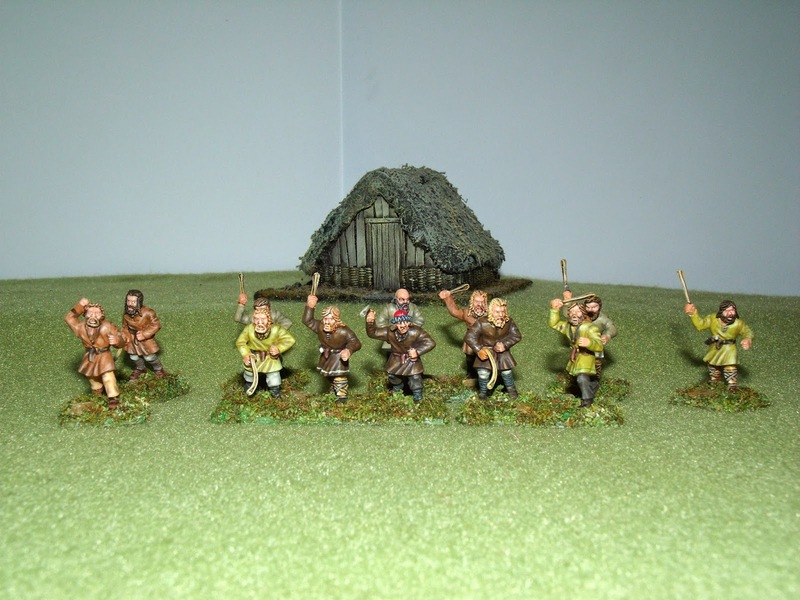 A pack of Gripping Beast Dark Age warriors will provide everything you need. The rules recommend building levy armed with slings or bows, and the kit provides more than enough sling-equipped hands to do this. 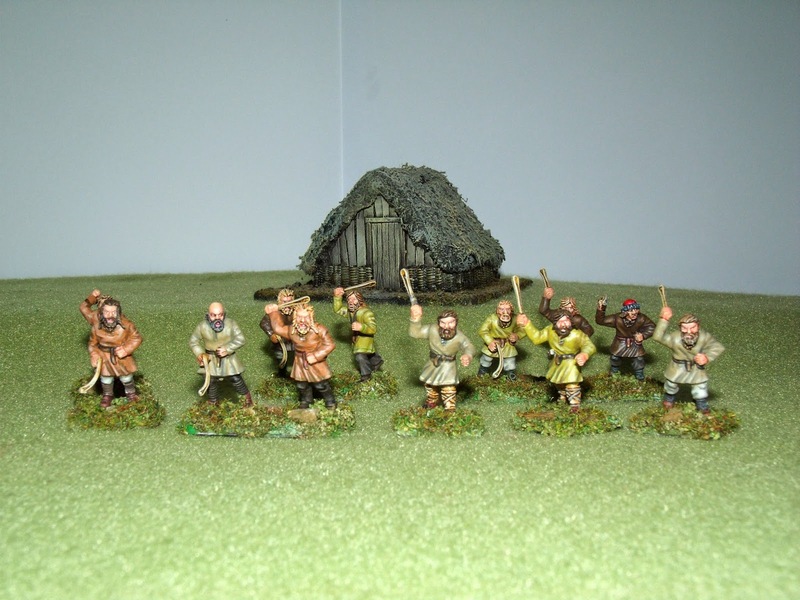 For the purposes of Saga, it doesn't make a blind bit of difference whether these men have slings or bows, as the weapons have the same characteristics. 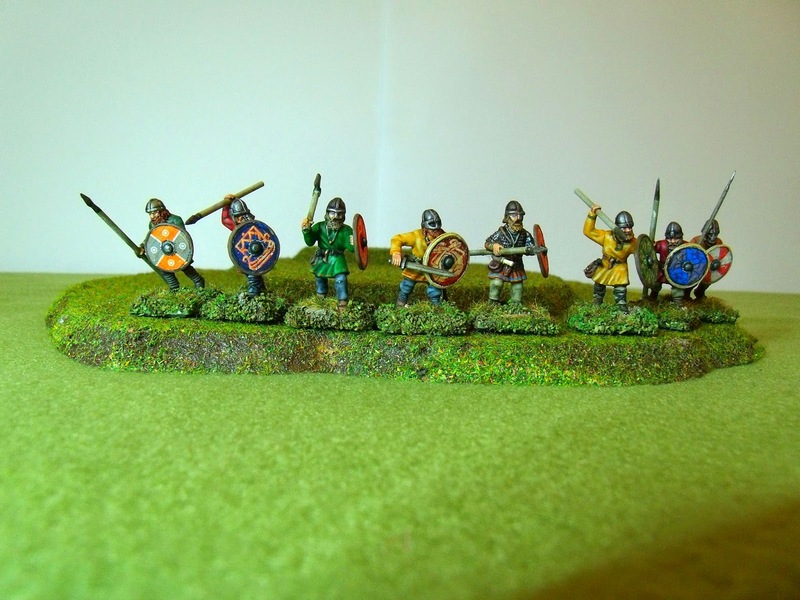 Converting the GB warriors to bowmen would take a great deal more effort, but would be possible if you really wanted some variety. Since levy are dirt-poor, the chances of them having weapons other than their slings (apart perhaps from a knife) are very low, and the chances of them having a helmet is about nil. 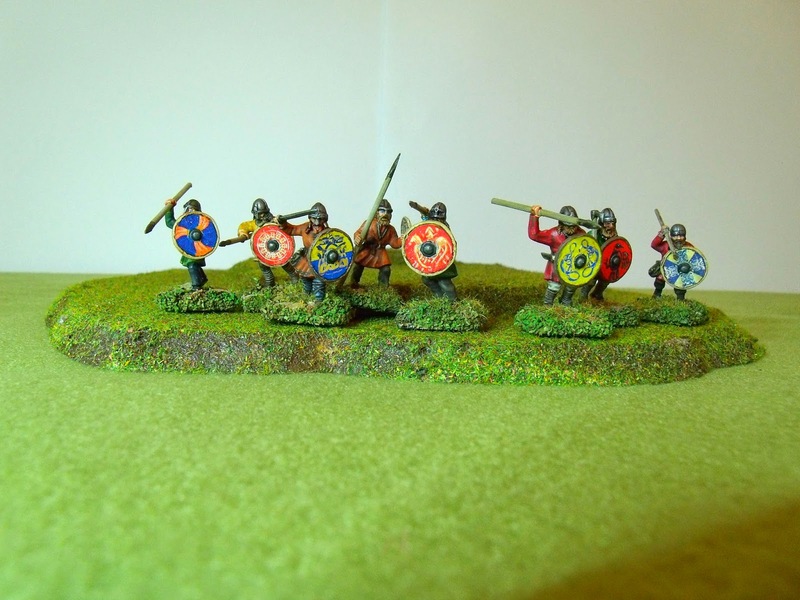 Therefore, the kit bare heads are all you need, and a bit of greenstuff or spares from the Viking Hirdmen box adds knives easily enough. I didn't give all of them knives - those with them are the ones with aspirations to rise to the dizzy heights of warrior status! Clothing would all have been dull, natural (ok, grubby) colours, as you would expect for people without two coins to rub together who spent most of their time doing vile, dirty jobs. This is of course nice and easy, and since you can get away with a fairly limited palette, it's also relatively quick. You could almost feel sorry for this lot. Almost. They're probably aching for a chance to get into a WAB game, where their impact could be greater and their status is less miserably low. ...And they don't look smarter from this side! The beauty of these is of course that whilst they've been painted up for use as Vikings, they are almost totally ubiquitous. They will slot seamlessly into almost any Northern European army from late Rome to roughly the First Crusade. Which is about as much praise as this lot are going to get! The warrior elements are slightly trickier, not in modelling terms, but based on what you actually want. Basically, you can't get what you want out of one box. The majority of Viking warriors are going to be equipped with a spear and other weapons like a saex or handaxe, a shield and most likely a helmet. On the other hand, most of them probably would not have a sword or mail, as these were high-cost, and hence high-status, items. Saying that, the odd one might: the sort of men who were aspiring to join the ranks of leaders or hearthguard. So, I made them up with unarmoured Dark Age warrior bodies, but used the spare helmeted heads from the Viking Hirdmen kit. 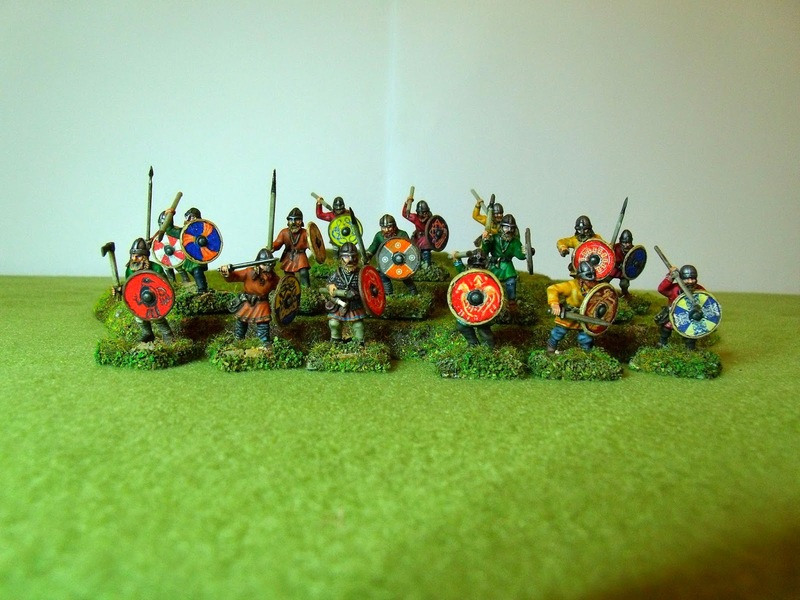 A unit of warriors in Saga is eight men, and I decided one or two per group with a sword might be reasonable, and possibly one with armour, but in his case, no sword. All these chaps got slightly colourful clothes - if they were even a bit successful they ought to be able to afford an odd bit dyed with a brighter colour or something with some embroidery or decoration. I went to town with the shields. Maybe a bit over the top, but they certainly standout. Here's the whole two points' worth of warriors. All told, I think these look the part. Lock up your valuables - these lads will half-inch anything that isn't nailed down and red-hot, and clobber anyone that tries to stop them. Alternatively, if you attack them in their homes, anything you come away with will have been pried from their cold, dead hands - assuming you survived trying. All together - altogether trouble! For the latest Dux Brit raid, Jeff and I played the convoy game. 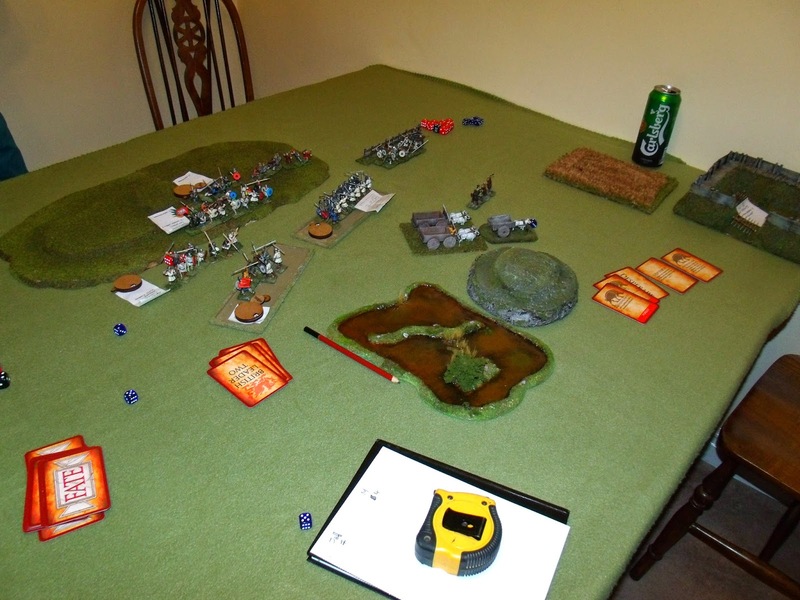 I took the Romano-British, under a new commander, following the crushing defeat I received last time. I had my hearthguard and warriors, plus one unit of levy defending the wagons, while the rest of the levy and archers, under the command of Cei, one of my nobles, was sat in the fort. Cei and his men are out of beans, bacon and beer and are desperately hoping Tristram and Bedwyr can get to them before they die of thirst. The game started slowly. Painfully slowly. 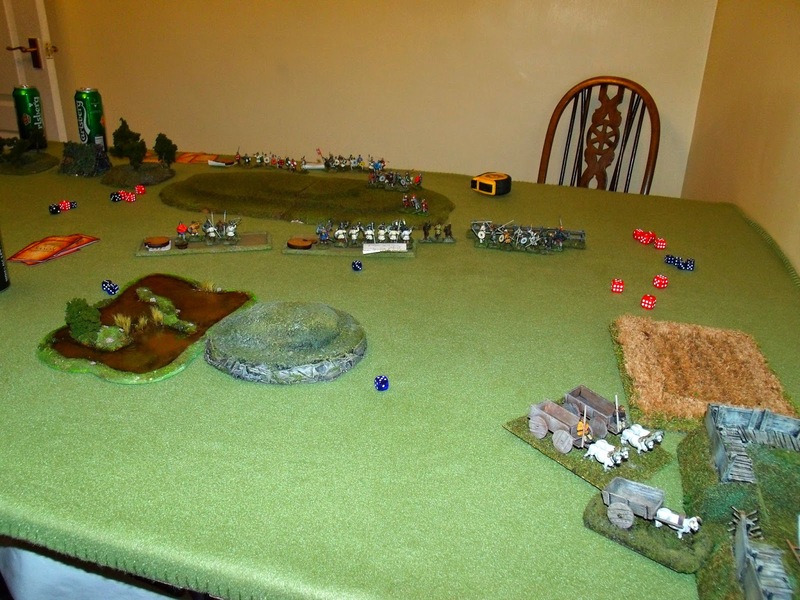 The wagons didn't so much roll as crawl like arthritic snails, as my two units positioned themselves to keep themselves between the wagons and Jeff's marauding Saxons. Fortunately for me, the only thing moving slower were the Saxons! Jeff struggled over the hill, making terribly heavy weather of the terrain, until he finally managed to reach my warriors. Jeff had a unit of skirmishers thistime, the result of his massive win last time. 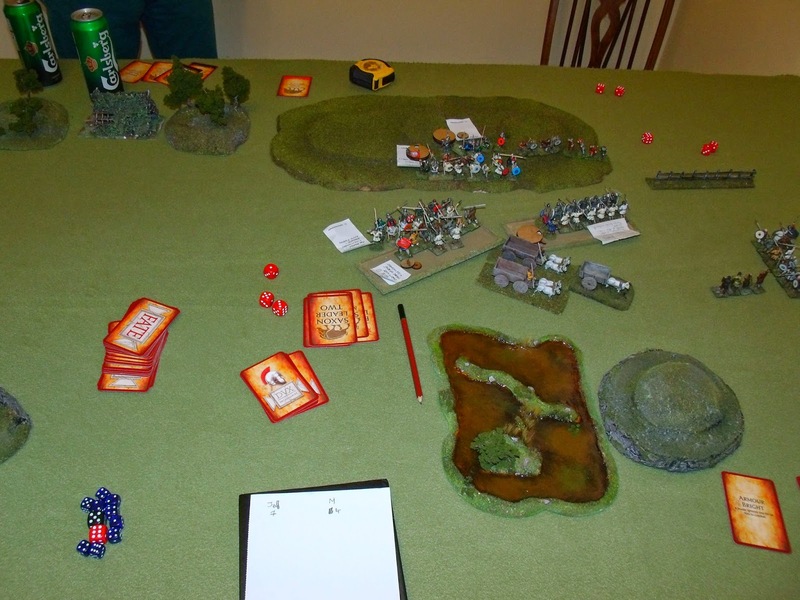 This was the first time the skirmishers had been out, and we were interested to see their effect. Finally one of his nobles, Cenric, managed to contact with Bedwyr, who was protected the back of the wagons with warriors and levy. Meanwhile, both Tristram and Aelle had several goes at rushing into combat with each other, but neither could achieve enough movement! Losing one pip of a D6 doesn't seem too bad, until you keep rolling ones and twos all the time! The satisfied themselves with insults, and ineffectual javelins and arrows from Jeff's archers and skirmishers. A sudden turnup for the books occurred here: Jeff sent Cenric to attack Bedwyr again. With Bedwyr himself wounded, and down to a unit of levy with a couple of surviving warriors, this ought to have been a massacre. But the shieldwall held, and Cenric fell back wounded, his men reeling with shock. Bedwyr managed to not follow up, which was just as well, and the wagons managed to crawl a bit further on. Aelle still couldn't force a charge against Tristram, and suddenly noticed that Cei had sortied with the rest of the levy, threatening his flank! Where the hell did that lot come from?! At this point, Jeff decided that the beans, bacon and beer simply weren't worth it, and Aelle retreated in good order - very slowly, again. Even the skirmishers couldn't help him! Tristram decided not to follow up, and the beer arrived safely, to slake the thirst of the weary Brits. Jeff was stymied by the terrain, and had he entered the table somewhere he could have moved a bit faster, things might have ended very differently. As it was, there were few casualties on either side, but my hand of pursuit cards left me with a thief's horde. Better than last time!